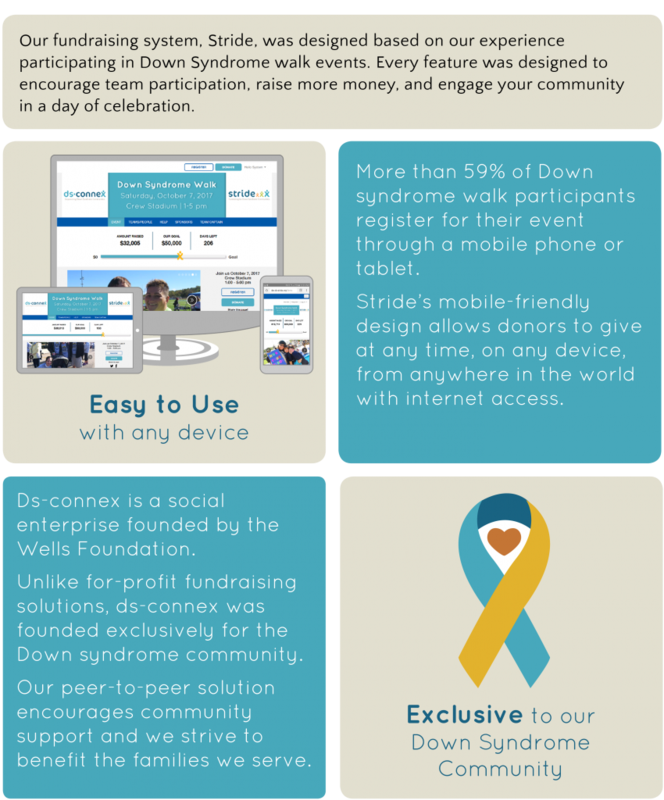 1: Stride is only for the Down syndrome community: The online fundraising system was built and customized based on our experience with the Buddy Walk® event. Our sole focus is supporting your event’s success. 2: Customized Banner: The customized banner allows you to select your own image for the homepage of your website. 3: Top Individual Fundraisers: The individuals who raise the most money for your event are recognized here. As individuals raise more money throughout the campaign, the list will adjust in real-time. 4: Top Teams Fundraisers: The teams who raise the most money for your event are recognized here. As teams raise more money throughout the campaign, the list will adjust in real-time. This is the total amount from the team’s members. 5: Goal Tracker: This is where the overall event’s goal is shown and how much money is raised to-date. It is exciting to watch it go up! 6: Rotating Photo: You can pick up to 5 event photos for the homepage photo (below the banner). They will automatically rotate through when someone is on the page, showing the event festivities to look forward to at the upcoming event. Highlight your beautiful Buddies and their families! 7: Local Customization: Add your Twitter account or Facebook feed directly to your event registration website. Allow your visitors to see how much the community is talking up your event. 8: Sponsorship Logos: Add an unlimited number of rotating logos to honor your local sponsors and in-kind contributors. Click the numbers below to learn more about the specific features Stride has to offer, or use the arrows next to the description above to be guided through all the features. 1: Customized story: Teams can share why your event is important to them, their families and friends. Many teams like to highlight their very special Buddy and get people excited about supporting their team through their story. 2: Customized photo: Here, teams can upload their own photos of their family, Buddy, or another photo to celebrate your walk. 3: Display of team members: The more members on your team, the more people they can reach out to for more participants and donations. See the list of all of your team members here. 4: Display of donations: Recognize the generous donations right on your team’s page, and see the donor’s notes of support for your team. 5: Goal-setting and amount raised: Set your own team goal and rally your team members around reaching the goal. As your team members reach out to their families and friends, you can see the goal get higher! 6: Linking social media directly to your team page – Link your Facebook and Twitter accounts right to your event registration page to keep track of your network’s social media activity about Down syndrome Walk, plus easily engage your network to donate to or join your team! 1: Checkout System: All registrations fees, t-shirt fees and initial donations are understood and verified by the participant. Many events charge different registration fees by adult, child , veteran or Buddies. 2: Registration Types: Participants can easily confirm the correct number of family, adult, child, solo walker, veteran, and Buddy registration types and fees. 3: Donations and Cart Items: Participants can easily confirm their initial donation and all the items they selected from the “Additional Items” Cart. 4: T-Shirt Sizes: Participants can easily confirm the total number of t-shirts ordered for their families and if the event charges a surcharge for any larger sizes. 5: Checkout Total: Total fees reflect both the grand total as well as the charitable tax deductible amount as defined by the event coordinator within Stride’s Administrative system. 6: Donations: While many events don’t charge a registration fee to attend, allowing someone to submit a donation at the time of registration will increase your fundraising results and make it convenient for them. 7: Selling Merchandise: Every event promotes and sells event logo wear or local organization merchandise such as hats, mugs and calendars. Utilizing the cart system to pre-sell merchandise will increase revenue and provide a more accurate quantity when ordering inventory. 8: Processing Fee: The processing fee can be added to each transaction to collect an additional amount to offset online processing cost. The fee can be excluded, optional by participant or mandatory in the admin area. 1: Custom Settings:Stride provides the most flexible fundraising solution developed exclusively for Down syndrome and Buddy Walk® events. Charge a registration fee or make it free, collect T-shirt information and sell logo wear when registering. Upload your own videos and picture that make your website feel local. No more calling website developers and paying fees to large software companies for simple changes. 2: Dates: Customized and personalized registration, promotion, and donation dates. Promote next year’s event or continue to engage participants and donors in your cause by simply turning off the registration process. 4: File Library: Upload your own banner, pictures, logo, documents and any other fun images that you would like. You can also upload videos for directions, waivers, donation forms, and sponsor logos. 5: Text Default: Customize content including waiver forms, receipts, and confirmations. Stride’s content management system lets you change any of your own wording whenever you like. 6: Themes: Upload your own banner, pictures, logo, documents and any other fun images that you would like. Also you can upload videos for direction, waivers, donation forms, and sponsor logos. 7: Social Media: Connect your Twitter or Facebook account directly to your event registration page and allow others to see your community supporters promoting your walk. 8: Updates and enhancements to Stride every year at no additional cost: Every year, we will be making improvements and enhancements to Stride. These annual improvements will be based upon what you, as a community, decide what’s important. The improvements will be free to you. 1: Impact Reports: Having access to up-to-date information is critical to running any successful event. Stride offers 13 different reports to monitor results for participants, teams and donations. Your databases will be accessible year after year, so you can compare your event to how you did in previous years. 2: Format Options: Download reports from many format options including CSV, PDF and Excel. 3: Customized Reports: Beyond the standard reports, event coordinators can create customized reports be selecting only the fields they need. 1: Download Rosters: Keeping track of team member’s email address, home address, phone number and t-shirt size is easy with downloadable rosters. You can also download donor’s information including address, donation amount, and phone number. 2: Keep everyone excited: Team Captains can email team members to keep them informed of fundraising progress, keep them excited about the upcoming event, or send specific details. Stride comes pre-configured with emails to thank participants for joining the team and soliciting donations. Team Captains can also email donors with a personal acknowledgment for their contribution. 3: Enter Checks and Cash Donations: Team Captains can now enter checks and cash provided for their team. This ensures that fundraising totals are accurate and reduces the burden of event organizing staff. 4: Purchase Cart Items: Team captains and any event registrants can buy cart items during or after registration. 5: Progress Monitoring: Monitor your team’s fundraising progress and social media activities in one centralized location. We love Stride - thank you so much!! SO much nicer working with people who understood what Buddy Walk was and having technology customized to the event. You were VERY responsive, helpful and exceeded our expectations. Great partnership on our end. Very easy to work with Dana, Lara and Jen and they all answered questions in a timely manner. Provided very helpful ideas that helped us increase followers in all areas of social media. Social media is absolutely crucial to announcing, organizing and communicating about events. Your assistance has been very beneficial and your suggestions will be beneficial for future events. All I can say is how very much all your help was appreciated. Our previous provider only could provide advice on their website and they were not Down syndrome focused. The social media overview and input was extremely helpful. Pictures are terrific. I love including the sponsor logos. The goal tracker and countdown also help us and those following our goals to be mindful. The team was terrific and always responsive and helpful!